Behold & Reflect: Review of "The Postage Stamp Vegetable Garden"
After being buried in snow and ice for the last weeks of February and first week of March, I've been ready for spring. Happily, I've had the perfect book to fuel my fantasy of warm days and garden-fresh produce. 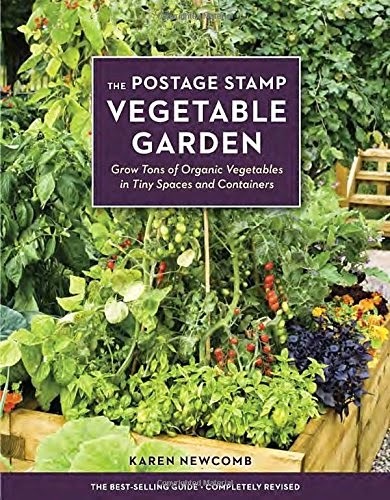 Karen Newcomb has revised her 1975 best-seller The Postage Stamp Vegetable Garden: Grow Tons of Organic Vegetables in Tiny Spaces and Containers. Newcomb advocates a method of gardening that produces unusually high yields of high-quality vegetables in tiny spaces by working hard on building up a rich, organic soil before planting and then coasting through the summer. In a postage stamp garden, plants are spaced closer together than the distance recommended by the seed packet and taller plants serve to shelter shorter ones from intense sun and evaporation. Newcomb also offers strategies for which plants can help replenish the soil and how to pair mutually beneficial crops. The author uses an upbeat and encouraging tone and writes passionately about a wide variety of heirlooms, making this book applicable to seasoned gardeners and motivated newbies. She makes a convincing case that produce raised on Miracle Grow is not nearly as delicious, healthful or safe as vegetables nourished with natural fertilizers. For this "brown thumb" some of Newcomb's descriptions of preparing the soil seemed daunting and potentially stinky, such as her insistence on horse manure and fish emulsion. Additionally, what Newcomb describes as little to no work after the garden is set up and going actually looks like a complex watering system that involves timers and misters or underground drip systems...and more applications of fish emulsion. Though the author tries to bolster city-dwellers with encouragement about container gardens, I got the feeling that to really implement her vision for productive gardening requires a good investment of time, labor and money. But, despite these draw-backs, I'm eager to attempt this method some day in the future.